1. Always take the time to plan ahead. If you will be renting a special venue you will need to secure it as far in advance as possible. Some places can book up even a year in advance. By finding your venue early, and placing your deposit, you can ensure that you get the venue that you want. 2. When you are planning a corporate event you need to set a very strict working budget and then make sure that you have extra cash for the unexpected expenses. You can be sure that every event will have some unexpected extra expenses, that is just simply part of planning an event. 3. If you have contracts, agreements, lists, or seating charts, make sure you keep extra copies of them in case they are misplaced or lost. Copying them is very simple and quick and can really save you later on if you loose your plans. 4. Make sure you send out your invitations at least 3 to 4 weeks ahead of your event. If it is a holiday event or you know the date you’ve selected might be in high demand, consider sending out “Save the Date“ cards a few months in advance of hour party. 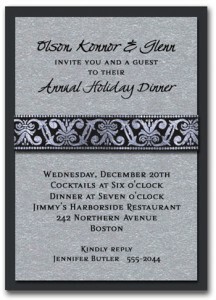 Make sure that you ask your guests to RSVP so that you know how many people will be attending. Don’t use “Regrets Only” if you need a reliable head count. Plan on calling the last rsvp holdouts too so you’re not surprised by extra attendees. 5. If you are creating a seating chart for your event, you can either set it up completely randomly or work with someone else in your company to come up with the best possible scenario to avoid faux paus in your seating choices. 6. If you want a good attendance at your event, it is a good idea to schedule your event earlier in the week or a long way away from any major holidays. People tend to vacation over holidays and often have plans on weekends, making Friday and Saturday bad days to have a business function. Take the time to make sure important “must have” people have your date open before you get too far along on the planning. Finding out the boss will be in Hawaii would be a disaster. 7. It is important to know when to use a theme and when not to. A child’s birthday party is an appropriate time to use a theme, while a corporate event requires much less of a theme and more plain elegance than anything else. Your theme might consist of colors used throughout, such as a silver and white theme, corporate color theme or festive holiday colors. 8. When you are having a business event, keep the music mellow and something that everyone can enjoy. 9. If you will need equipment such as microphones, projectors, speakers, a video camera. etc., you want to make a list of the things you will need and make sure that you also have someone on site who can fix any technical problems which may come up at the event. 10. When you are planning an event, especially a large event, make emergency and contingency plans in case of disaster, illness, rain if you’re planning an outdoor event, or any other emergency. 11. It is important to take into account the special accommodations which will be needed by any disabled attendees. If you do not know what someone will need, you can always simply ask them. They will be happy that you cared enough to ask and understand that you didn’t have any other way to get the information. 12. If you are planning a very large event, you might want to take a project management approach to it. Use a master plan, and delegate tasks to others where you reasonably can. 13. If your event will be longer than two hours, your guests will expect at least a snack to eat. You should have a meal if your event is longer than four hours. At all times, you should have at least water and coffee available to your guests. 14. Communication is a major key to the success of an event. If you are using vendors, make sure they have very clear and specific instructions of what you are expecting of them. 15. Whenever you plan an event, make sure you take things like transportation, parking, etc… into the equation. The last thing you want is for your guests to have to walk a long way to the event or to go home because they couldn’t find a place to park. This entry was posted on Saturday, August 2nd, 2014 at 2:38 pm	and is filed under Business, General Info, Parties. You can follow any responses to this entry through the RSS 2.0 feed. You can skip to the end and leave a response. Pinging is currently not allowed. Just wanna comment about this article, after reading whole of this it make me to have new vision about one big event, hope I can read more quality news again from you so I’ll subscribe your website. Hi, it’s a very good article, and nice idea. I wish more people would write blogs like this that are actually fun to read. With all the crap floating around on the web, it is rare to read a blog like yours instead.